Mayer Plumbing offers a wide range of air conditioning products and services to meet your every need. Contact us at 440-885-2800 440-885-2800 to inquire about how we can improve your existing home, with our quality products and services. What are the air conditioning basics one should know? What should one understand before buying an air conditioner? What are the types of air conditioners? In a packaged central air conditioner, the evaporator, condenser, and compressor are all located in one cabinet, which usually is placed on a roof or on a concrete slab next to the house’s foundation. This type of air conditioner is also used in small commercial buildings. Air supply and return ducts come from indoors through the home’s exterior wall or roof to connect with the packaged air conditioner, which is usually located outdoors. 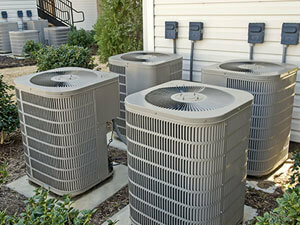 Packaged air conditioners often include electric heating coils or a natural gas furnace. This combination of air conditioner and central heater eliminates the need for a separate furnace indoors. How do you maintain existing air conditioners? Refrigerant Leaks: If your air conditioner is low on refrigerant, either it was undercharged at installation, or it leaks. If it leaks, simply adding refrigerant is not a solution. A trained technician should fix any leak, test the repair, and then charge the system with the correct amount of refrigerant. Remember that the performance and efficiency of your air conditioner is greatest when the refrigerant charge exactly matches the manufacturer’s specification, and is neither undercharged nor overcharged. Why is regular maintenance necessary for air conditioners? Why are air conditioner filters important? Why are air conditioner coils important? Why are coil fins important? Why should air ducts be sealed and insulated? Why should you buy new air conditioners? How are air conditioners sized? How is air conditioner efficiency measured? Each air conditioner has an energy-efficiency rating that lists how many Btu per hour are removed for each watt of power it draws. For room air conditioners, this efficiency rating is the Energy Efficiency Ratio, or EER. For central air conditioners, it is the Seasonal Energy Efficiency Ratio, or SEER. These ratings are posted on an Energy Guide Label, which must be conspicuously attached to all new air conditioners. Many air conditioner manufacturers are participants in the voluntary EnergyStar® labeling program (see Source List in this publication). EnergyStar – labeled appliances mean that they have high EER and SEER ratings. What EER should room air conditioners have? How much SEER should central air conditioners have? What should I look for when hiring professional service? Give you a written warranty on equipment and workmanship; and Avoid making your decision solely on the basis of price. The quality of the installation should be your highest priority, because quality will determine energy cost, comfort, and durability. Why are installation and location of air conditioners important? Minimize air leakage by fitting the room air conditioner snugly into its opening and sealing gaps with a foam weather-stripping material.